About half of the seventeen pieces in Monica Rezman’s exhibition “The Pollen Path” are straightforward acrylic and charcoal works-on-paper. Those familiar with this Chicago artist’s oeuvre will note that, though her driving obsession with hair is still present, it’s not always front and center. In this show, the black serpentine marks that once appeared to be her works’ sole raison d’être are tempered by the inclusion of flatly colored geometric shapes. Cool blues, greens and the odd yellow or brown rectangle punctuated by dashes of brilliant orange collide head-on with lines that might just as easily be mistaken for cobwebs; together, they energetically scramble for position on the picture’s surface. There’s a simplicity to the arrangement in these drawings that translates as confidence rather than a lack of ideas. It’s the artist’s relationship with space, in contrast to what the accompanying statement describes as “rituals of femininity and the beauty industry,” that is the primary motivation here. 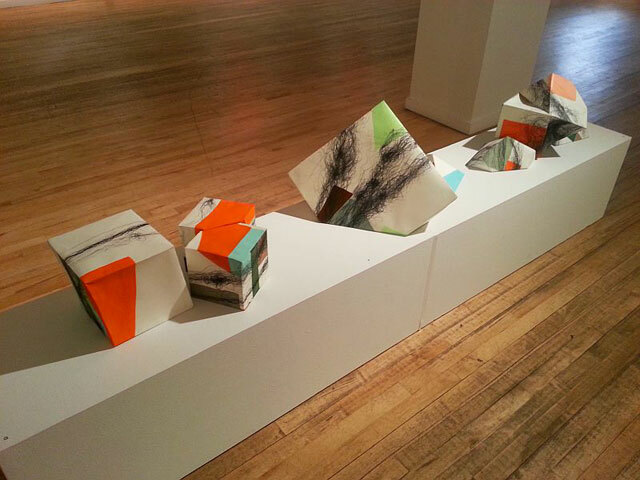 Perhaps the most striking examples of Rezman’s investigation into our shared ether are her untitled three-dimensional paper forms. These geometric works share their two-dimensional counterparts’ unpretentious contrasts between color and value, line and shape, with the added beauty and symmetry of something resembling a Platonic solid. Whether stacked or placed horizontally, the union between their surfaces’ illusory space and their volumes’ occupation of actual space is compelling. Through February 15 at Packer Schopf Gallery, 942 West Lake. 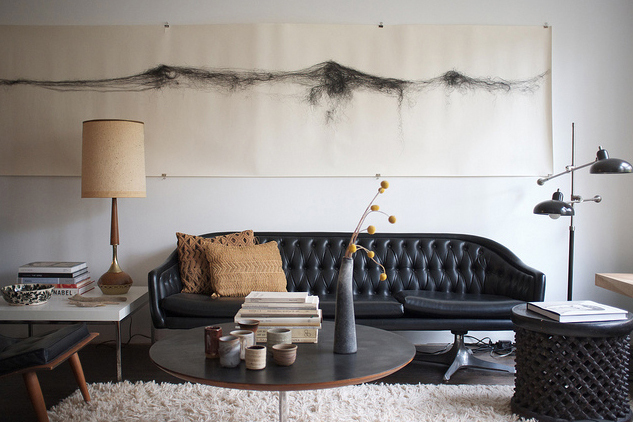 CHICAGO — Monica Rezman makes drawings and paintings of hair. She used to work in the fashion industry, and when she came over to the slower visual world of drawing and painting, she spent a while making careful transcriptions of unraveled wigs that resulted in abstract linear patterns. This transformation of something seen into something interpreted continues in her beautiful show of work at Packer Schopf Gallery. Most of the new pieces are charcoal and paint on paper. The hair patterns are rendered in charcoal, the overlapping lines swirling in dense skeins that snake around the surface or cluster together in knots. Beneath the charcoal lines are irregularly shaped blocks of painted color in a cool palette of browns, blues, and oranges that have echoes of 1950s design. The color shapes provide a support for the linear drawing that sits on top of them and push the lines forward so they aren’t floating in empty space. 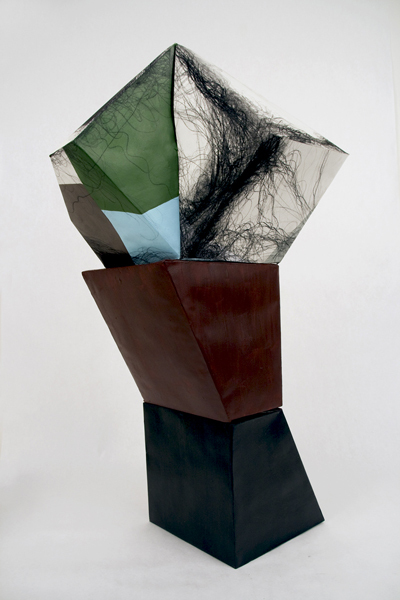 This contrast of line and shape creates an interesting tension between messiness and order, which Rezman pushes further in pieces that are folded, glued, and stacked so that they become three-dimensional. A couple of works are placed on pedestals, their shape clearly paying homage to Constantin Brancusi’s “Endless Column.” Others are more randomly polygonal and placed in a row near the floor level. I found myself responding even more strongly to these, possibly because they aren’t quite as highly finished as the wall-based pieces; they draw attention to both the delicacy and the strength of paper as a material. If you read about Rezman’s preoccupation with hair in relation to her work, you’ll find a lot of discussion about “rituals of femininity” and so forth. I guess it’s possible to see these works and immediately say, ‘Ah, yes, this is clearly hair and is meant as a commentary on the beauty industry.’ But my reaction was simpler: this is an artist who uses drawing as a means of finding her way into a picture, and it’s that sense of surprise and discovery that absorbs the viewer’s gaze, too. Monica Rezman: The Pollen Path continues at Packer Schopf Gallery (942 West Lake Street, Chicago) through February 15. 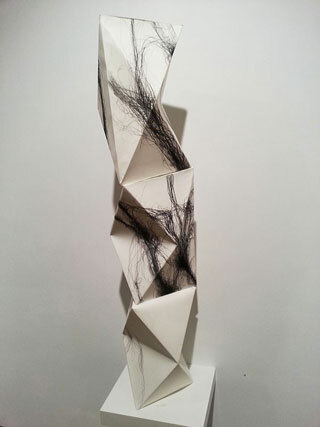 Monica Rezman's drawings and photographs at Navtaschulz Gallery are two different bodies of work, though one from each is often hung next to the other and the two are presented as if they were a diptych, with the common element being a longtime interest of the artist: the representation of hair. The large charcoal drawings, however, generally present female hairpieces as fool-the-eye objects mounted and casting shadows as if they were elements in a still life. The exception is a long horizontal drawing that has the hair extended into a virtual landscape with four peaks that suggest a mountain range. Rezman's color photographs, on the other hand, use hair on a female figure to suggest various emotional states, the strongest of which is abandon. The black-clad figure generally is in motion, captured as a blur, with long hair obscuring facial features as it is tossed about. But the figure is not quite what she initially may seem, and the hairpieces she wears are agents of her transformation. So the photographs have an embedded subtext about illusions and womanhood, whereas the drawings are purer and tend toward the abstract. WHAT: Rezman, 49, is a painter who also makes works on paper and recently added photography to her oeuvre. She was a clothing and textile designer for 10 years, then went back to school in her early thirties at the Florence Academy of Art in Florence, Italy, and the School of Representational Art in Chicago. WHERE: Rezman has a two-story coach house behind the Logan Square home she shares with her husband, Jamshed Writer, and 4-year-old daughter, Ruby. She uses the first floor as a gallery space and the second floor as a studio. "As a child, I used to watch my mother alter her hair with falls and wigs, and now I watch Ruby, who is often in my studio with me, experimenting with female adornment the same way. It prompted my new series on the relationship of hair to female identity." WHEN: Rezman's work is represented by NavtaSchulz Gallery, 1039 W. Lake St., 312-421-5506, or by appointment (visit her Web site at www.monicarezman.com). Art Space News: The Artist Project The work of Monica Rezman was also a show-stopper. Monica Rezman is a painter, textile designer, and most recently a photographer who currently splits her time between Chicago and India. Rezman has always been fascinated by ways women use personal adornment as A kind of language. Splitting time between the east and west has served to broaden her vocabulary. Through April 7. Daily. Tue, Wed, Thu, Fri, Sat 12pm-6pm. Navta Schulz Gallery, 1039 W Lake St between Carpenter and Aberdeen Sts..
Monica Rezman's charcoal drawings of hair have a powerful presence. One is tempted to reach over with a comb and clear out the tangles. Through Apr 7.